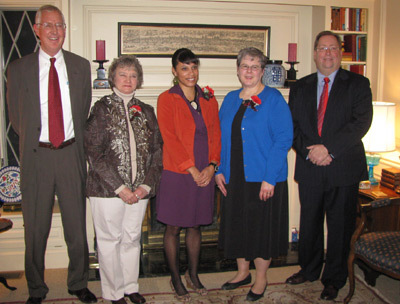 CAPTION: Chillicothe R-2 faculty and staff members were all smiles Wednesday night, as Laurinda Davison (right) was acknowledged as the 2011 Beacon Award winner, during the Chillicothe Education Foundation dinner benefit, at the home of Ed Milbank. 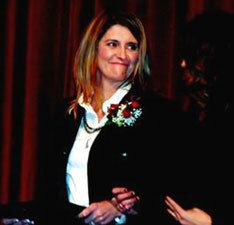 Davison won the honor (sponsored by the Education Foundation) back on December 9, 2011. Christine Jones won the 2011 Teacher of the Year award at that time, as well. Education Foundation chair Ed Douglas estimated that Wednesday's benefit had garnered over $15,000 in donations, and that, since the dinner's inception in 2001, they had raised close to $165,000. 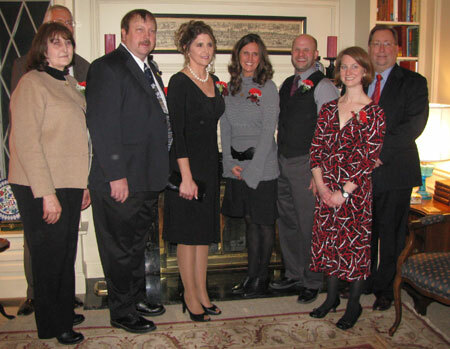 The Chillicothe community and the Chillicothe R-2 school district were both well-represented Wednesday evening at the annual Education Foundation benefit dinner, held at the home of Ed Milbank. Foundation chairman/president Ed Douglas welcomed the crowd, and thanked Milbank for again opening his home to the public. The benefit has taken place every year since 2001, Douglas said. He expects the foundation has made approximately $165,000 in dinner donations, alone, over that span. "We've probably averaged $15,000 or more [at these dinners, per year] for those 11 years," Douglas said. "I think we're going to be over $15,000 [this year]." Douglas reiterated the importance of the foundation's causes, including (on top of the Teacher of the Year and Beacon Award recognitions, approximately $3,000 in mini-grants, and an optional $2,500 in teacher recruitment expenses) the backing of the new football stadium north of the Chillicothe High School (which he stated he hoped would be done by the fall), thanked the donors and participants in the evening, and said that he had presented the education foundation model to multiple communities in the surrounding area, all to great fervor. Douglas honored the 2011 R-2 Teacher of the Year and Beacon award candidates and winners. He read a short paragraph about each one for the crowd on hand. 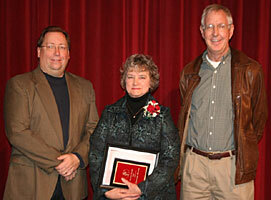 Laurinda Davison, a middle school library aide, was first presented as the 2011 Beacon Award winner. 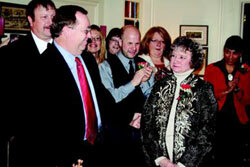 She received $300 from the Chillicothe Education Foundation back during an assembly on December 9, 2011. Other support staff nominated for the award were: Julie Chastain, representing Dewey and Garrison schools; Richard Gibson, from Field School; Kathryn Midgyett, from Central School; Marty Rogers, of the high school, and Yvonne Haslar, of Grand River Technical School. Each nominee received $100 from the foundation. Davison, Midgyett, and Rogers were all present at Wednesday's benefit in time for the photo. Yvonne arrived at the reception later. Dan Venner (Field), and Kari Keller (Garrison/Dewey). 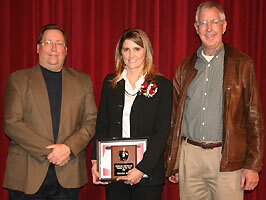 Christine Jones was acknowledged as the 2011 Chillicothe R-2 Teacher of the Year. Jones is an eighth grade science teacher at Chillicothe Middle School. Other teachers nominated for the award were: Kari Keller, representing Garrison and Dewey schools; Dan Venner, representing Field School; Michelle Vinson, representing Central School; Jeanne Lair, representing the high school; and Kenny Estes, of Grand River Technical School. All were present Wednesday. Jones was awarded $1,500 on December 9. The candidates received $1,000 each to use for classroom materials and $500 each in a cash stipend - also from the Chillicothe Education Foundation. In all, the foundation awarded $10,800 to local teachers and support staff this year. They annually award $3,000 in mini-grants across the area, and they provide the R-2 district with an option of $2,500, used for teacher recruitment. 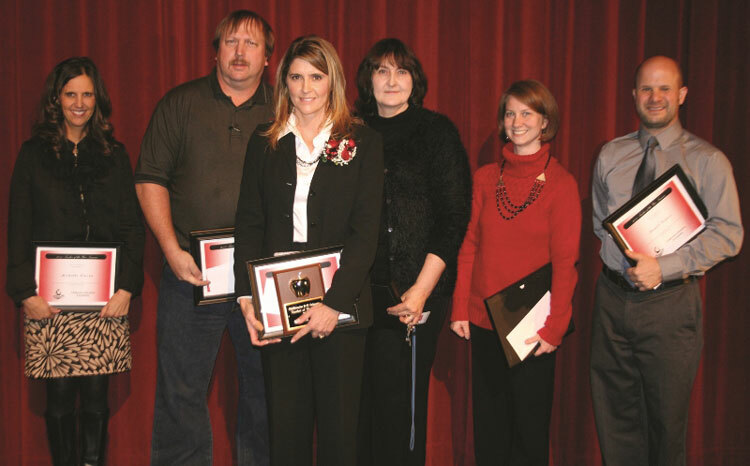 CAPTION: Chillicothe Middle School eighth grade science teacher Christine Jones (center) was announced as the 2011 Chillicothe R-2 School District's Teacher of the Year during an awards ceremony held Friday, December 9, in the Gary Dickinson Performing Arts Center. Jones beat out Kari Keller, Dan Venner, Michelle Vinson, Jeanne Lair, and Kenny Estes for the award. Middle School eighth grade science teacher Christine Jones was honored as the 2011 Chillicothe R-2 School District's Teacher of the Year during an awards ceremony in the Gary Dickinson Performing Arts Center. As the 2011 Teacher of the Year, Jones receives $1,500 cash and $1,000 for education items to be used within the classroom - prizes financed by the Chillicothe Education Foundation. Other teachers nominated for the award were: Kari Keller, representing Garrison and Dewey Schools; Dan Venner, representing Field School; Michelle Vinson, representing Central School; Jeanne Lair, representing the high school; and Kenny Estes, of the Grand River Technical School. Those teachers received $1,000 each to use for classroom materials and $500 each in a cash stipend - also from the Chillicothe Education Foundation. Roger Barnes, Christine Jones, Ed Douglas Christine Jones (middle, front), is shown with the other nominees (left to right): Michelle Vinson, Kenny Estes, Jeanne Lair, Kari Keller, and Dan Venner. Click photos for a closer view. Several members of the district's support staff were also honored during the presentation, including Laurinda Davison, a middle school library aide, who was named the 2011 Beacon Award winner, and received $300 from the Chillicothe Education Foundation. Other support staff nominated for the award were: Julie Chastain, representing Dewey and Garrison schools; Richard Gibson, from Field School; Kathryn Midgyett, from Central School; Marty Rogers, of the high school, and Yvonne Haslar, of the Grand River Technical School. Each nominee received $100 from the foundation. 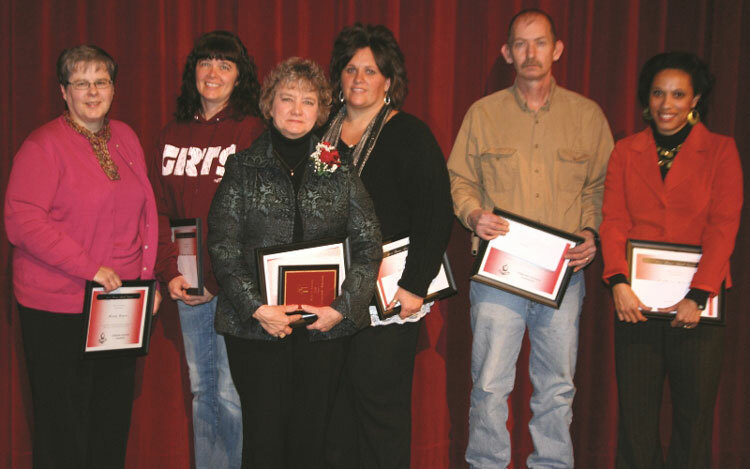 Roger Barnes, Laurinda Davison, Ed Douglas Laurinda Davison (middle, front) is shown with the other nominees (left to right): Marty Rogers, Yvonne Haslar, Julie Chastain, Richard Gibson, and Kathryn Midgyett. Ed Douglas, chairman of the Chillicothe Education Foundation, presented the awards to the recipients and told those gathered that the foundation is proud to sponsor the district's Teacher of the Year and Beacon Awards programs because they encourages excellence within the Chillicothe R-2 school system. "The mission of the Chillicothe Education Foundation is to support local education in a way that the district would otherwise be unable to do," he said. Through the program this year, Douglas said, the foundation was awarding $10,800 to local teachers and support staff, as a reward for their outstanding service to the district and its students. The Chillicothe Education Foundation board is comprised of Ed Douglas, president; Mike Turner, treasurer; Julie McCoy, Ad Hoc School Board Member; Ron and Roger Wolf, Co-Directors, Grand River Technical School; Mary Staton, director; Edward P. Milbank, Director; Brenda Fellhoelter, secretary; Dr. Bruce Brodmerkle, director; Lindy Chapman, director; Inger Young, director; and Dr. Roger Barnes, Chillicothe R-2 Superintendent. Barnes said that the district is very appreciative for the Education Foundation's support. He added that the district is comprised of many outstanding teachers, administrators and staff members, whose dedication and support of our most important individuals, the students, is recognized by both the Board of Education and by the community. And for their commitment, he said, he is truly grateful. Also during the presentation, Barnes presented several staff members with pins for their years of service to the district. Those receiving pins were: Tiffany Acree, Brad Cavanah, Billie McGraw, Bryan McKay, Traci Norris, Savannah Phillips, Lisa Rule, Stacy Surber, Rachael Wheeler, Brooke Wolf, Delores Carpenter, Amy Hand, Roberta Hartwig, Johnnie McLean, Melody Munson, Marty Rogers, Susan Tate and Pam Thompson, five years; Patricia Adkison, Jayme Caughron, Vicky Duckworth, Arch Haslar, Tracy Miller, Jane Schmidtz, Annette Shipp, Nancy Thorne, Laurinda Davison, Julie Gibson, Polly Musselman, Connie Quigley, Debbie Shaffer, 15 years; Dianna Haynes, Debra Willard and Michael Christopher, 20 years. Terri Figg received a plaque for 25 years of service; Mary Dusenberry received a plaque for 30 years of service.